British Heart Foundation is a charity dedicated to fighting against cardiovascular disease. We’ve worked with them for just over four years to support them in their aim of achieving this goal. Over this time, we have created a breadth of communications such as, a fundraising pack to give people ideas and encourage them to have fun whilst raising money for the charity. We’ve also developed useful guides for young patients who are about to have heart surgery, as well as creating a full series of heart information packs for patients detailing the different risks and lifestyle factors, various heart conditions, tests and treatments. Do your own thing fundraising is one of the key drivers of income community fundraising for British Heart Foundation, it enables supporters to get on with their fundraising without the need for additional support or materials. It’s the main tool to guide supporters on fundraising and enable them to organise their own fundraising event and help the ‘fight for every heartbeat’. 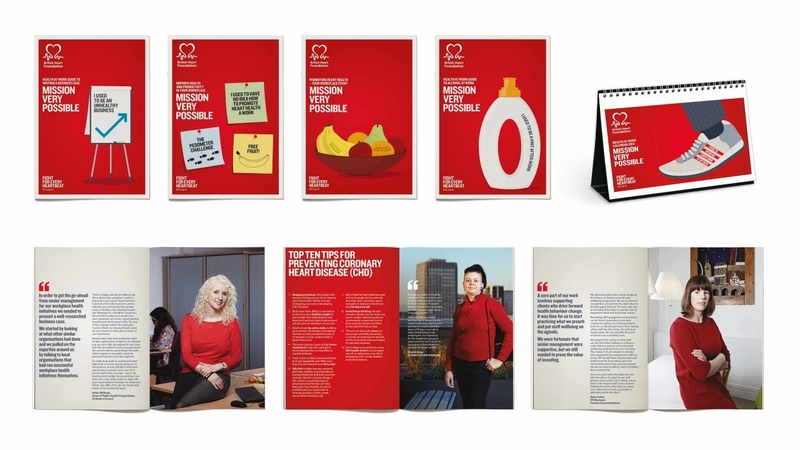 We worked with BHF to create a new fundraising pack that would be used by their new and existing supporters, empowering them to fundraise and engage with the BHF brand in a way that encourages them to take action. New ideas, guidance and tools are all included in the pack, making it easy for supporters to get involved. British Heart Foundation wanted to motivate workplaces to consider the heart health of their workforce by introducing a new initiative. ‘Health at Work’ is a free programme for workplace health and wellbeing coordinators to successfully raise awareness amongst colleagues of healthy eating, physical activity, mental wellbeing, smoking and alcohol use. To help raise awareness of the programme and engage employers and employees, we built on a core idea of ‘Mission Very Possible’ and applied this to a suite of communications to motivate and engage members to develop health and wellbeing programmes in their workplace. A calendar was created to introduce monthly activities and events, with advice and tips on what employers could do to promote health and wellbeing across their organisations. The Heart Information Series booklets are seen as the backbone of heart disease information in the healthcare setting, with nearly 2 million ordered in the last financial year alone. The purpose of the books is to provide relevant and authoritative information on key heart health topics that are clear and easy to digest. The booklets are used directly by the general public, patients, their families and friends, and by intermediaries such as health professionals, community health promoters and corporate partners. They cover such topics as risk and lifestyle factors, heart conditions and treatments. 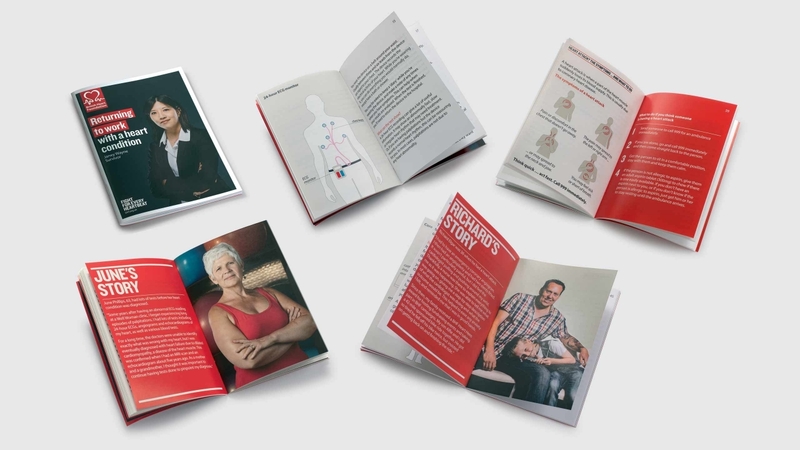 We have redesigned the Foundation’s most popular series of heart information guides with an enhanced visual identity and improved patient-centred approach, format and content to help engage their audiences. In 2015, BHF headed to the Labour and Conservative Party Conferences with the mission to engage with MPs and Ministers, to increase their understanding of BHF’s impact, and the significance of medical research in finding new treatments. 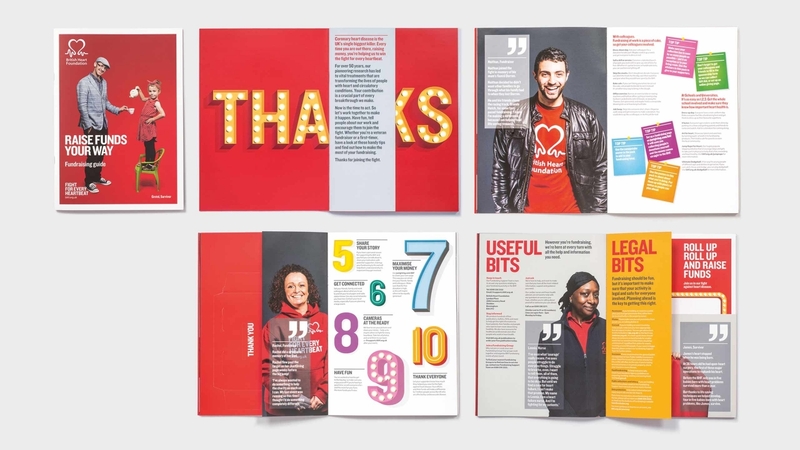 The BHF wanted something interactive, exciting and engaging to help give them an opportunity to talk about the importance of protecting the science budget, to continue the success of improving people’s quality of life. The interactive challenge was to have a time limit of 2 minutes where a blood cell was to race around the human body to complete a circuit. Along the way, the gamer would learn more about BHF’s successful research such as their discovery of the links between cardiovascular disease and high cholesterol. The prime aim for this interaction is to prompt discussion about the importance in continuing the breakthroughs in medical research, particularly linked to treating cardiovascular disease. Purpose created a tabletop racing game, much like a F1 circuit, inviting MPs and Ministers at the conference to take part. The racecourse played a significant part in giving essential knowledge of the BHF’s achievements. And the end-game focused on the aspect that although the game had ended, BHF’s research never ends. The challenger was timed and a scoreboard with their name was on public display, underneath the message “Keep UK research in pole position”. 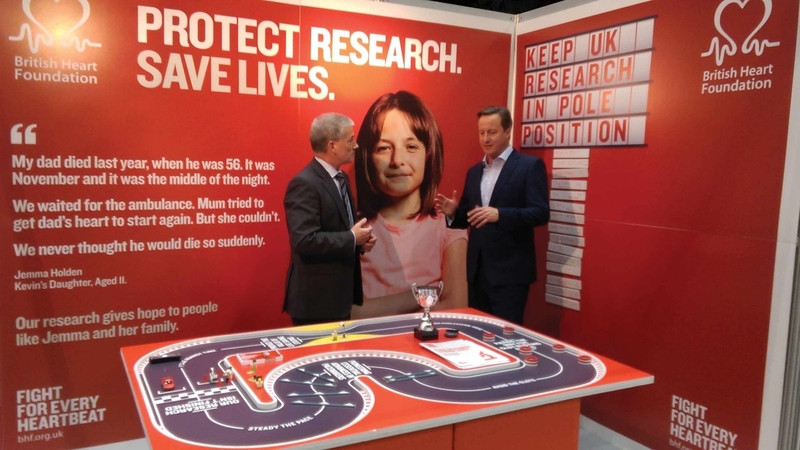 The stand was a triumph winning “best stand” at the Labour Conference and was also visited by the Prime Minister, David Cameron.